As we recently announced, Wowza released version 4.0 of its award-winning server. Wowza Media Systems even changed product name to Wowza Streaming Engine to indicate the evolutionary progress. And even though it now has a management interface, WMSPanel still has something to offer for Wowza users - our rich feature set covers a variety of use cases. However, there are still a lot of companies which use previous versions of Wowza. Migrating the existing streaming system to new software version may take some time and people may want to skip the upgrade if existing installation works perfectly already. A lot of customers use Wowza Media Server 3.0 or 3.6 in their infrastructure and we even have customers who still use Wowza Media Server 2.2.4 stable release just and it works fine for them. It's extra important for old versions because they don't have built-in server management system while WMSPanel provides both server management and streams management solution. The latter feature set is implemented differently in Wowza 2 and Wowza 3 and we support both implementations, this this is a unique solution. The same applies to paywall feature set for Wowza which includes hotlinking protection, geo-location lock and pay-per-view framework. It will work regardless of Wowza version. So we put efforts to keep our Wowza agent working with all popular Wowza versions. It takes additional resources but we want our customers to have the best user experience. Of course you may have a combination of different versions within the same WMSPanel account, they will all fit perfectly. Now try our control panel in action during 2 weeks free trial. With the release of Wowza Streaming Engine 4 Wowza Media Systems made a great step towards better user experience. 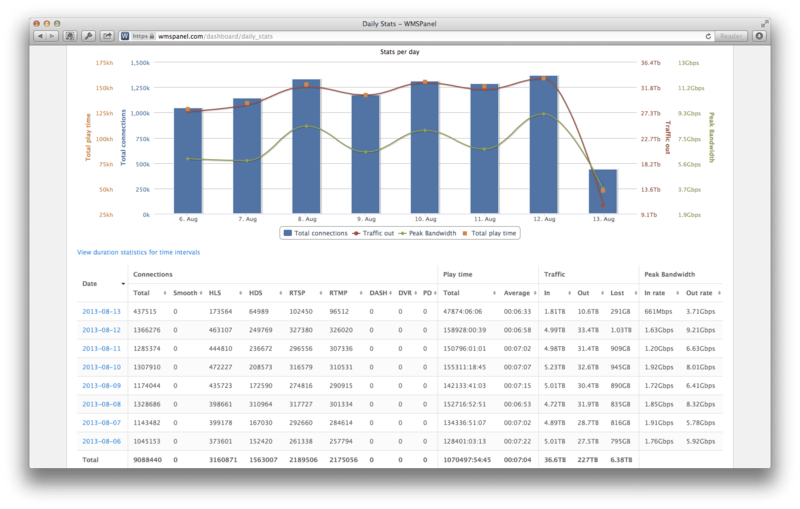 Its server control and monitoring dashboard provide a great way of controlling a single given media server. How does WMSPanel fit this new Wowza approach to server management? WMSPanel still works perfectly for any user of Wowza Streaming Engine. Let's review basic areas of useful functionality. In spite of the fact that Wowza management web GUI provides a great user experience for majority of control features, WMSPanel can still propose unique capabilities. WMSPanel provides multiple servers management. When an administrator wants to make some action like creating application, or its instance, or managing streams, he selects the designated servers and applies an action to them. It will be applied and this action will be logged in central panel log. 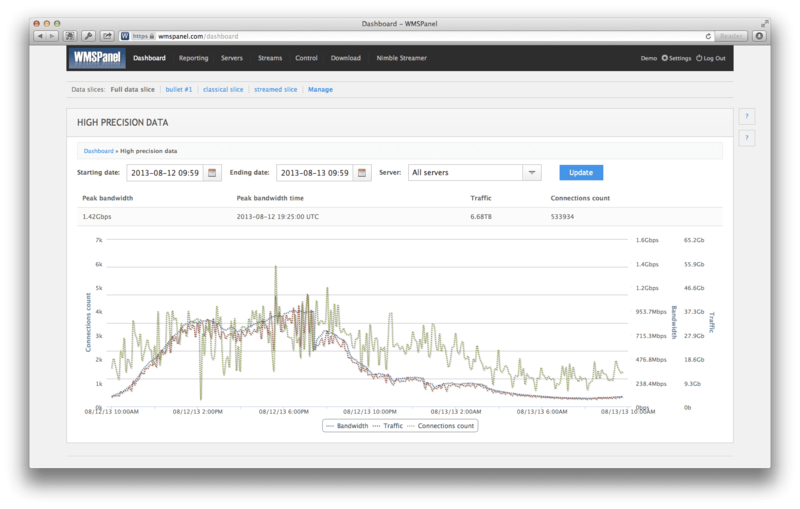 WMSPanel gives an exterior third-party view on running server so it can alert about server downtime. Moreover, with Dispersa streams availability monitoring an administrator can be sure that he's notified about any gives stream malfunction. So if you manage a number of Wowza servers and live streams, WMSPanel is still useful for you. That's where WMSPanel does its best. All of your Wowza servers will send statistical information and WMSPanel central handler will process and store this info for further display via web browser. It works from any device with a web browser, including iOS and Android. Here's what the panel can do for you. 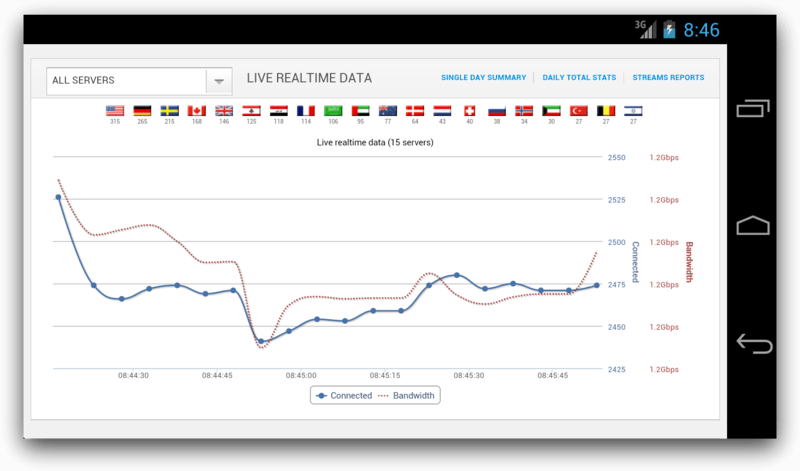 Daily statistics include a variety of reports including connections, bandwidth and traffic, geo-location report, playtime and duration, players and devices stats. High precision report gives statistics for connections, traffic, peak bandwidth and 95% bandwidth with 5-minutes granularity. Streams real-time and retro statistics will give you a brief snapshot of any given stream. White label - let's start with the end-user look. 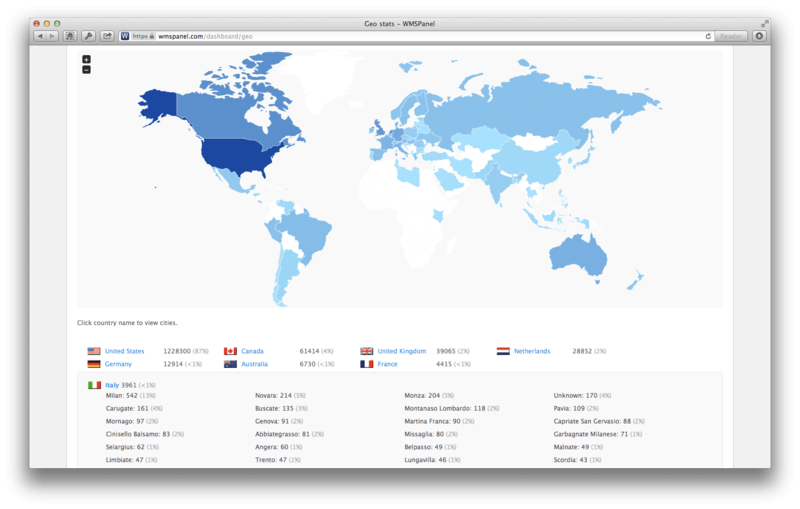 You can set up your own domain, logo, CSS and even favicon for displaying reports. Moreover, you can create multiple domains with their logos and favicons. 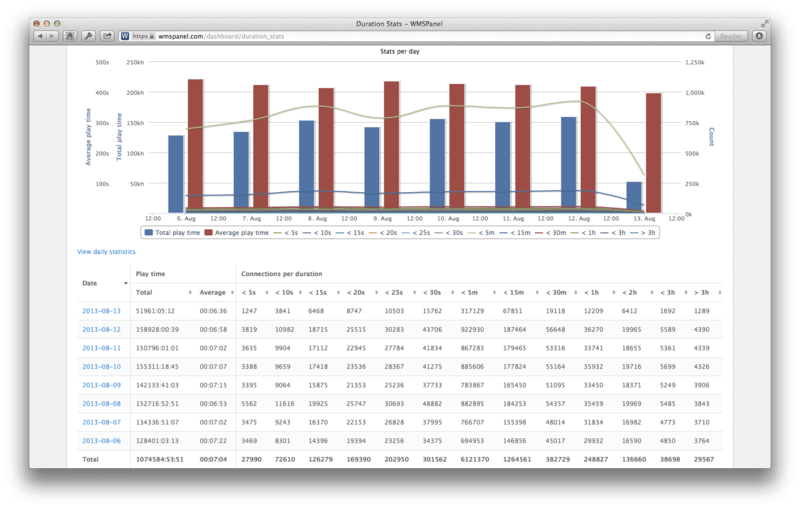 Data slices allow splitting your statistics into any number of buckets and assign non-admin users to see those statistics. You can create both applications-based and streams-based slices. Having white label, you can give end-users access to their data via separate domain or domains. You can even make end-user billing based on user's data. Statistics export API allows you obtaining the collected statistics for further processing in case you have some complex data processing mechanics within your company. With all this you may have a full view of what's happening to all your Wowza servers. You can watch it real time or get back to collected data any day after. 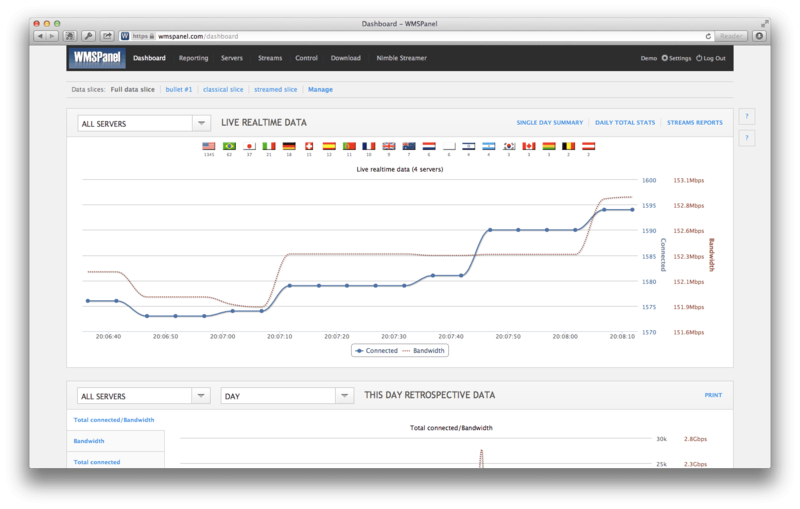 On top of advanced management and excellent reporting, WMSPanel gives more power to control streaming process. Pay-per-view framework gives ability to control every connection and every unique user to make user-based workflow. Hot-linking protection allows protecting streams from re-streaming, or links hi-jacking. Geo-location and IP range restriction gives a tool to define location-based viewers control. Connections and bandwidth limitation can give you a simple way to set up quantitative limits for your media. Check out "The Paranoid’s Guide to Internet Video Streaming" to see real-life example of using pay-per-view feature set. So WMSPanel is more than yet another control panel tool. It's a framework for controlling the streaming process and collecting the data for further business analysis. And if you need more than just configuring apps and streams, WMSPanel is the right way to do it. If you are already using WMSPanel and would like to upgrade Wowza, please use this instruction for WMSPanel agent migration. Please also check the full list of supported Wowza versions in case you'd like to keep using Wowza 2 or Wowza 3. Now sign up and try these features if you haven't tried them yet. We've recently released a new screencast which shows how to make manual stream check over and set up streams monitoring. Subscribe to our YouTube channel to get new videos as soon as they are released. We are proud to announce new feature set for live streamers. Nimble Streamer is now capable of transmuxing UDP MPEG-TS live stream into HLS stream. It's part of feature set for live streaming via HLS. The basic use case is converting multicast/unicast MPEG-TS stream into HTTP live stream on-the-fly. Current article is outdated as we continuously improve our feature set. Check this article for MPEG-TS transmuxing setup and general Nimble Streamer MPEG2TS feature set page. We are glad to see that Wowza Media Systems has just made another big step forward. They have released Wowza Streaming Engine which was formerly known as Wowza Media Server. Wowza Streaming Engine has version 4.0 to show continuity with Wowza Media Server product version 3.6. Wowza team has also made a re-design of their website to reflect the change for their product concept so the latest information regarding Wowza Streaming Engine is available here. No need to enumerate all the new and existing features - just visit the website and see them yourself. WMSPanel is part of Wowza technology alliance, this is why we had an honor to try Streaming Engine as part of product preview before it was officially announced. WMSPanel agent for Wowza was working fine, as expected. Now when the official release is here, we've tested it again and we can confirm that WMSPanel agent works perfectly with Wowza Streaming Engine 4.0. Server management capabilities with streaming control. Let us know if you have any specific use cases or requirements so we could help you choosing the right feature to use. P.S. If you still use older versions, like Wowza 2.0 or 3.0 or 3.6 - no worries, the same agent will work fine as well. Nimble Streamer can be used for HLS re-streaming for both VOD and live modes. For VOD we primarily use disk cache. By default each chunk is stored for a day after the last request. Once the service is re-started, Nimble will start requests to origin services via the user agent specified in the config. Please learn more about latest VOD cache control features here. As long as we develop some features for Nimble Streamer, we make simple prototypes to get familiar with the protocols implementation and algorithms. So today we've released another prototype for converting UDP MPEG2TS stream into MPEG2TS HLS chunks. It will be soon available as part of Nimble Streamer so having the working prototype we are sure that it's feasible within the product. You can simply run the Ruby script which will listen to port 2000 and transmux incoming UDP stream to MPEG2TS HLS chunks. If you have any contributions, feel free to fork and commit your changes. Contact us if you need more information on upcoming functionality of Nimble Streamer. UPDATE: Nimble Streamer is now able to tranxmux MPEG2TS to HLS, MPEG-DASH, RTMP, Icecast and re-stream to other MPEG2TS streams. Check also MPEG2TS Nimble Streamer page for details. Please also consider WMSPanel server tasks remote management via web console for convenient control of server-side commands. Launch any command, like ffmpeg process, with no need to log in via SSH, just an easy-to-use web interface.